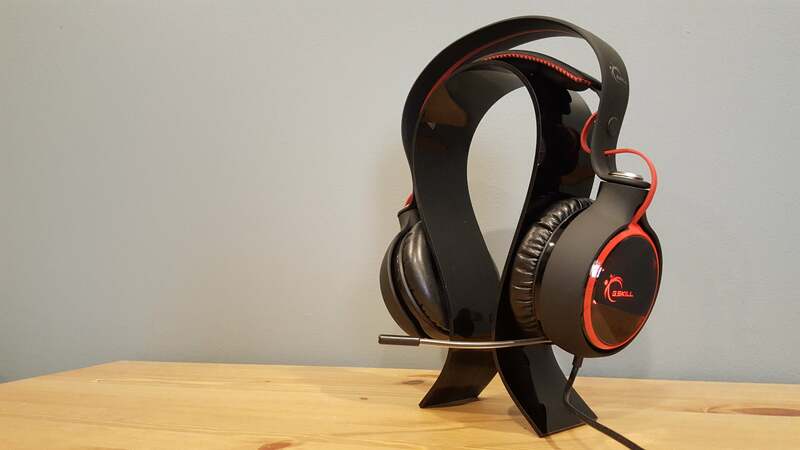 The SR910's design and sound issues tank this headset's appeal. A few months ago, my look at G.Skill’s debut mouse, the Ripjaws MX780, left me impressed. G.Skill created a solid performer at a below-market price during its first time out the gate. 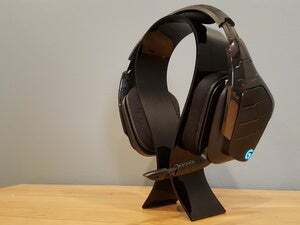 So when it came time to review G.Skill’s debut headset, the USB-enabled Ripjaws SR910 (available on Amazon), I had high hopes. If all went well, we could be looking at a HyperX Cloud type of surprise. Sadly, the SR910 isn’t the breakout hit that the Cloud was. The most pressing problem is that this headset is huge. I already have a pretty big head—I tend to max out (or come close to maxing out) the adjustable bands on most headsets. But the SR910 is too large and loose for my head, so I can only imagine how poorly it would fit on a smaller noggin. 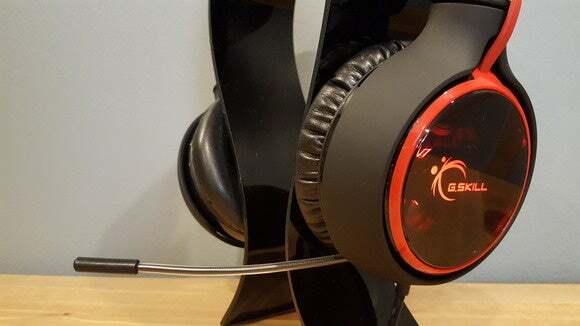 The SR910 borrows the suspension band design made famous by SteelSeries’s Siberia line (and recently appropriated by Kingston’s HyperX Cloud Revolver). With exposed wiring that needs to constantly stretch and retract, this style is quite a bit more fragile than a traditional headband. The most common issue is that the ear not directly attached to the input wire will stop working. This design does have a benefit—incredible comfort. The headset almost seems to float, like it’s barely touching your head. But it also adds to the SR910’s fit issues. Most of these suspension-band designs counter the floating band with a bit of pressure on the jaw. Not a ton, but enough to hold the headset in place. The SR910 doesn’t have nearly enough tension to stay in place, and when combined with its greater-than-average weight, the result is a headset that slips downward until it comes to rest on the tops of my ears. The situation is exacerbated by the fact that the headset is weirdly tall. When I put on the HyperX Cloud Revolver or any of SteelSeries’ Siberia line, I don’t quite push the headset to the metal band, but it’s close. With the SR910, the top band still sticks up about an inch and a half, causing the headset to slip downward or tip over if I look down. Because it’s all of a piece, there’s no way to adjust the headset to make it smaller. Thus I found myself having to readjust the SR910 upwards every few minutes, like pushing a pair of glasses up the bridge of my nose. Otherwise the weight would make the tops of my ears sore. It’s a shame, because I typically enjoy these suspension-band designs. 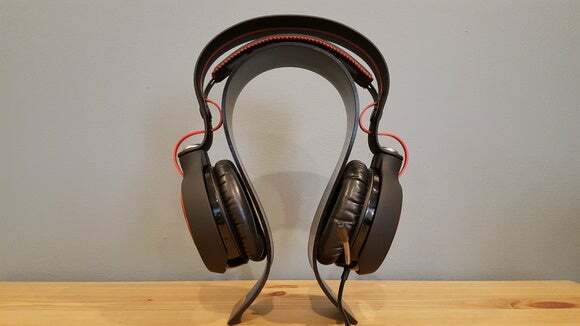 They’re only suitable as gaming headsets (and not as streetwear), but they’re comfortable and make a nice showpiece. I just can’t imagine who the SR910 was built for. I can admire its swooping red-and-black curves from a distance, but I’d rather not put it on. Oh, and this wired headset’s cable is just plain ol’ rubber—no fancy fabric sheath here. If the SR910 sounded good, that would offset some of its design issues. Unfortunately, it’s one of the weakest headsets I’ve used in a while. The SR910 has a decent gimmick. Many headsets nowadays rely on virtual (software-driven) 7.1 surround, but the SR910 features five drivers per ear for “real” 7.1. There are a couple other gaming headsets that do this, like the Razer Tiamat and the Asus Strix. 1) Headsets don’t really need “real” 7.1. (They don’t really need virtual 7.1 either, but that’s a discussion for a different day.) On any headset, the drivers are so close together and the earcups are so small that cramming in five per ear, as with the SR910, doesn’t provide any real benefit. 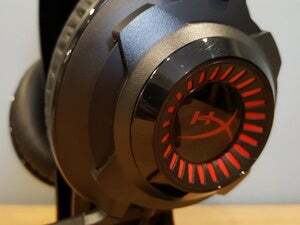 The performance is on par (or worse) than just using a regular stereo headset with a decent sense of directionality—like, say, the HyperX Cloud. 2) Manufacturers skimp on the drivers, in order to fit multiple ones inside an earcup and to make the headset affordable. With a standard stereo headset, half the driver space and budget goes to each driver. Put in 10 and you’ve now drastically reduced how much you can spend per driver and still keep the headset a decent price. These factors are evident when you put on the SR910. 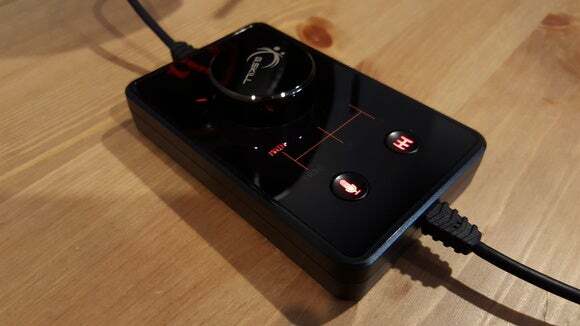 The tinny, washed-out sound of this headset overshadows whatever you gain by having 10 drivers. Listening to music is a particular chore, with the SR910 generally sounding worse than the $8 pair of Panasonic earbuds I wear around the city. The sound is a little less flat than earbuds—that’s those 10 drivers at work—but the bass has no punch, the mids sound grainy and overly compressed, and the highs are almost nonexistent. G.Skill has software that accompanies the SR910, and I’ve tried tweaking the sound in dozens of ways. I’ve wiggled the bass up, but it just got louder instead of fuller. I’ve tried boosting the mids, but it just sounded more compressed. I rolled off the highs, but that left recordings sounding flat. Whether in stereo mode, Quadraphonic, 5.1, or 7.1, the SR910 just doesn’t sound great. Certainly not good enough to justify its $160 list price, though its standard $80 Amazon listing does seem more in line with what I’d expect. And heaven forbid you touch some of the other software tweaks that G.Skill provides. You can change the virtual room size to add or subtract reverb—settings like “Stone Room” or “Hangar.” Regardless of the setting, the post-processing leaves it sounding like you’re playing music through grandpa’s old AM radio. Gaming performance is slightly better, insofar as it’s usually harder to notice distortion or compression in sounds like gunshots, footsteps, and the like. It’s still not great, though, and I’d place it towards the bottom of the headsets I’ve reviewed. To its credit, G.Skill does include some handy features. I like that the headset comes with a control box included. While I’d prefer smaller inline controls, the volume knob is handy and it’s easy to adjust EQ settings on-the-fly. Click-to-mute is a superfluous feature, but it’s nice to have. And the microphone is retractable, so props to G.Skill for hitting par on that one. It’s not a great microphone—I felt like I was yelling into it most of the time, and the audio output is tinny. But at least it gets out of the way when you don’t need it. I can’t recommend the SR910. 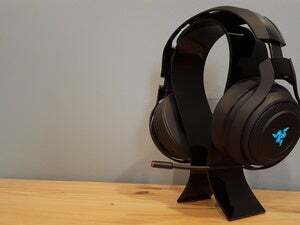 There are plenty of headsets that are solid, middle-of-the-pack contenders—headsets that I wouldn’t choose as my daily driver, but which I could see someone selecting for the design, or because they like this or that feature. The SR910? Not compelling. Lackluster sound quality, a gets-the-job-done mic, and a tension band apparently designed for someone with a mammoth-sized melon do not a classic headset make. 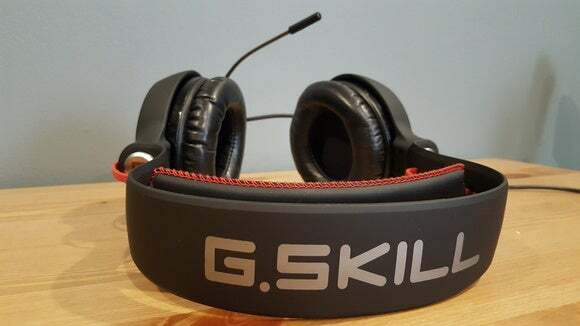 Hopefully G.Skill’s sophomore effort fares a bit better.